Production on The Mandalorian has been underway for over a month, but casting announcements are just starting to roll out. Following yesterday’s reveal that Pedro Pascal may be leading the series, The Hollywood Reporter brings word that Gina Carano is also joining the cast. The report offers no details as to who Carano might be playing. However, it’s likely a role that involves a great deal of action. Before breaking into films, Carano began her professional career as a mixed martial artist. She remained undefeated in the sport until she lost in a Strikeforce competition against Cris Cyborg. That fight marked the first major MMA event headlined by two women. After transitioning to acting, Carano garnered mainstream attention for her lead role in Steven Soderbergh’s Haywire. She has also appeared in Fast & Furious 6, Deadpool, and a handful of direct-to-video films. Whether she’s playing a hero or villain on The Mandalorian, it’s safe to assume that she won’t need a blaster or any other weapon to fend off her adversaries. All that’s known about The Mandalorian so far is that it’s set after the fall of the Empire, but before the rise of the First Order. The series describes the title character as “a lone gunfighter in the outer reaches of the galaxy far from the authority of the New Republic.” No release date is set, but it will be one of the first shows to premiere on the Disney+ streaming service. The platform will serve as the home for other new Star Wars programming as well. A Cassian Andor series is also in development with Diego Luna reprising his role from 2016’s Rogue One. 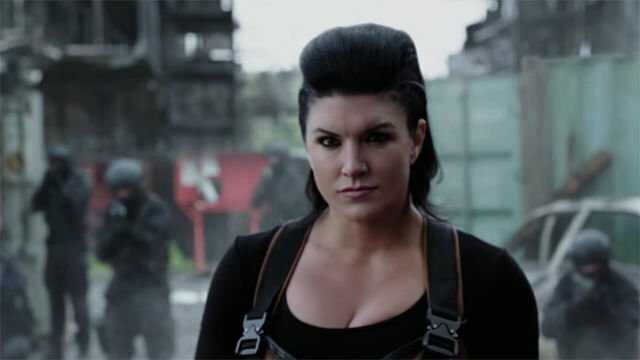 What do you think of Gina Carano joining the cast of The Mandalorian? Do you have any theories about her character? Give us your impressions in the comment section below!